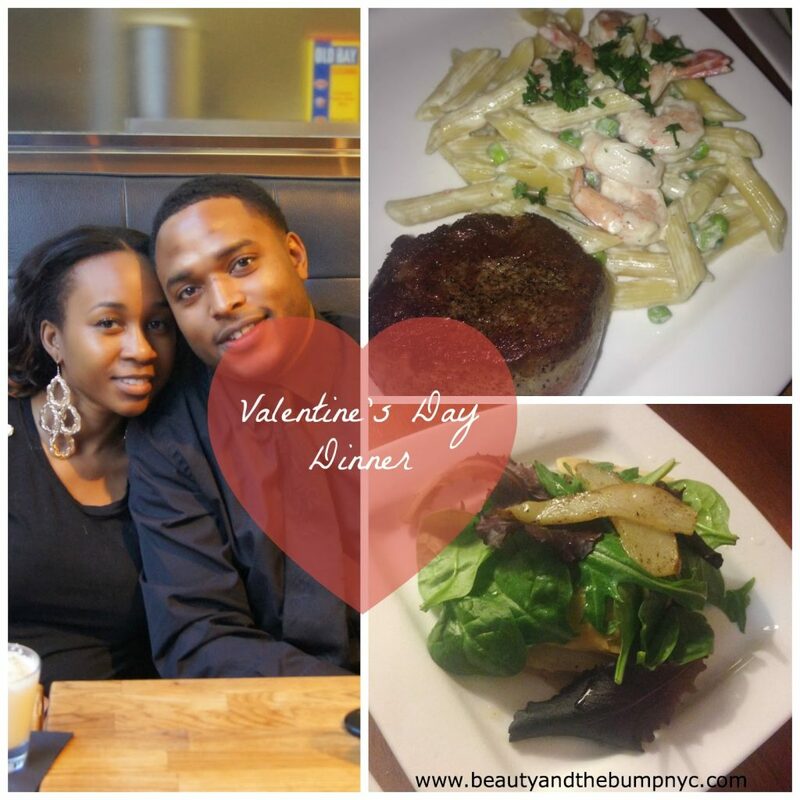 This Valentine’s Day, I figured I’d surprise my “boo thang” aka the husband with a sort of fancy meal. With the help of my chef sister, we dined on Shrimp Carbonara (sorry, no pancetta or eggs), Filet Mignon, and Pear Tartlet Salad. 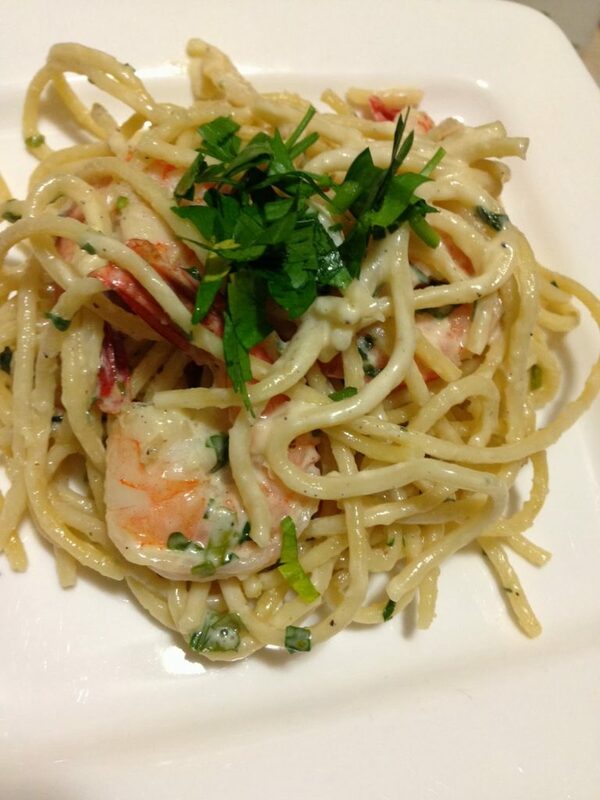 The Shrimp Carbonara was very simple to make. It was so easy that I recreated it the other day. FYI: Alot of the measurements are guestimates. I’m sorry… Blame my sister .:lol:. She never gives me measurements, so I’m forced to figure it all out myself. I must say, it has helped me become a better cook. 1. Boil your pasta according to the instructions, and set aside. You don’t want to overcook them since you’ll be adding them to the sauce once it’s cooked. 2. First things first, season the cleaned shrimp with a little salt and pepper. 3. Over medium heat, and with one tablespoon of olive oil, saute the shrimp until they are pink. You don’t want to cook them fully because we will add them back into the sauce later. 4. Once the shrimp have turned pink, remove them from the pan. Set aside. 5. Add the remaining oil to the pan, and saute the garlic for lets say, 1-2 minutes. 6. Reduce the heat to medium-low, and add the Mascarpone Cheese by Vermont Creamery, and whisk constantly for about 2 minutes. 7. Add the Parmesan cheese, and whisk for about 1 minute until it’s completely blended. 8. Now add the half and half (I’d say around 1 cup or more if you like your pasta to be saucy) , and whisk. 10. Now add back the shrimp and the cooked pasta, and fold it into the sauce. You don’t want to stir it. When I used spaghetti noodles I just used metal tongs to toss the ingredients so that everything mixed together. Let that simmer some more until the shrimp are fully cooked. 11. Add the chopped parsley, and fold it into the shrimp and pasta. 12. Serve & eat. You may top it with fresh parsley, too if you’re feeling fancy. If you try out this recipe, please let me know. 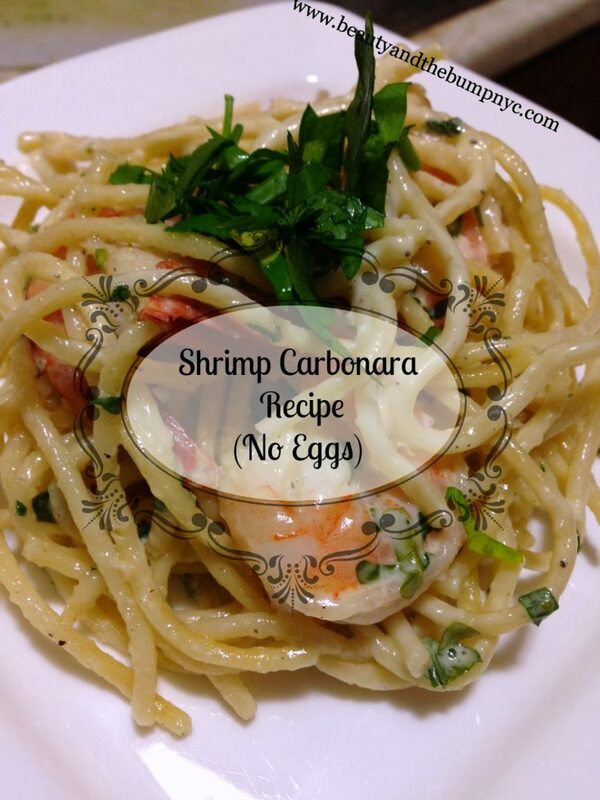 This Shrimp Carbonara Recipe is great for people suffering with egg allergies, so try it! « How We Saved Tens of Thousands of Dollars in One Year!